In Skövde, there are more than 1600 beds spread across hotels, hostels and cabins. 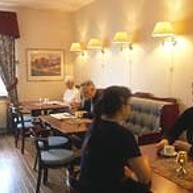 There is also a number of private rooms for hire. 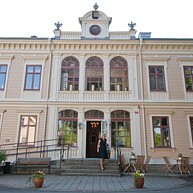 Clarion Collection Hotel Majoren is partly situated in a socialite villa from the turn of the century. It is close to the cultural center and railway station. All the rooms have their own special touch and some of them still have the old fireplaces left. 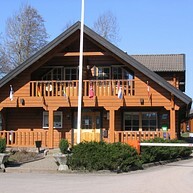 You can also find a relax area with sauna and in the restaurant an evening buffet is served. You can also have homemade cookies and freshly brewed coffee. This hotel is beautifully situated at the top of the mountain Billingen with an amazing panorama view over the city. The hotel offers a wide range of activities and entertainment, such as spa with a hot pool and sauna, a restaurant, a heated outdoor swimming pool and adventure mini golf. First hotel Billingehus is well adjusted for conference guests as well. Stay close to both nature and the city center. Here you will find different alternatives for an overnight stay; choose between cottages, camping and hostel. When you stay here you are in the middle of Billingen recreation area with walking tracks, outdoor swimming pool and small fishing lakes. In the wintertime there is also cross-country ski trails, a ski slope and much more. 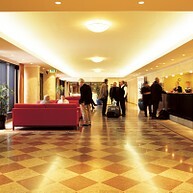 Hotell Prisma is centrally located approximately 300 m from the railway station. This smoke free hotel has a total of 185 beds. The rooms are bright, fresh and clean. Sit down in the hotel restaurant and enjoy everything from simple dishes to a real feast. Free parking spots are available. Stay in an old soldier’s residence that has been on the same location for 150 years. Outside you see green pastures where the animals of the farm graze. A big oak will catch your eye on the way down to the little lake Hattaren. Breakfast, bed sheets and towels are included. 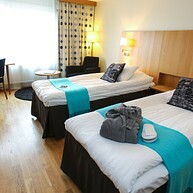 Welcome to Scandic Billingen, a central hotel only 75 m from the railway station. You live in the middle of the city, close to both shopping, culture and entertainment. The hotel was built in 1888 and has ever since been appreciated for the atmosphere and architecture. All the rooms are smoke free and have free WiFi. Free access to the hotel gym. This central hostel is situated in a beautiful house from the turn of the century and in an adjacent annex. There are pleasantly decorated rooms, both smaller and larger. All of them have a shower and toilet in the room. You can access the big garden as well. Free parking. Stay in the countryside in this beautiful house from the late 1800’s. Room by room is now being redecorated, but will keep the old charm with furniture and wallpaper in older style. Close to the city but still in the countryside. 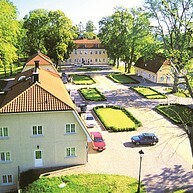 In this manor environment, situated in a green park area by the Karstorp Lake, you find accommodation for all situations. Regardless if you come for a conference, enjoy a weekend or celebrate something you will have an experience you won’t forget. 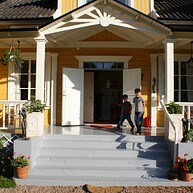 Attention, closeness and quality are obvious rights for the guests at Knistad. All rooms have shower or bath, toilet, tv and internet. The sense of luxury is increased when you hear the quietness and feel the smell of nature – at Knistad you find all the ingredients for a perfect day! This affordable hotel has well equipped rooms and is situated right next to the railway station. It is close to all the shops, restaurants and cafés in the city. 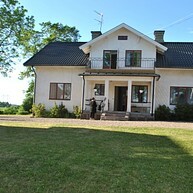 Located in the middle of the beautiful "Vallevägen" (Valle road) in the countryside you find this picturesque B&B. The garden is lush, and the favourites are peonies and wild roses. Use the garden and relax - play board games or have a BBQ, or why not have your breakfast in the morning sun? Welcome! In the middle of Skaraborg, just outside the village Tidan, you find Hostel Berglunda in a beautiful cultural environment. In the spaceous garden you find fruit trees, hang mats and a bbq. 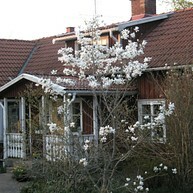 You find this idyllic accomodation around 25 km from Skövde city center. Stay on your own or bring your family! Close to sights such as Askeberga Stone setting, Lake Östen, Vaholms covered bridge and the famous flea market in Tidan. There is also a camparea for caravans and campervans.